Only recently a new range of agents has become available that are capable of stimulating and regulating host defense systems against microorganisms. Interleukins, interferons and haematopoietic growth factors are now being produced by the biotechnology industry and are being evaluated for clinical use in this area. 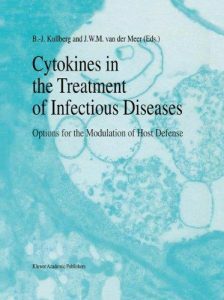 Cytokines in the Treatment of Infectious Diseases provides a unique, up-to-date survey of this research area. The use of cytokines in a series of (groups of) infectious diseases is discussed in twelve succinct chapters, from model to clinical study, written by twenty-five expert authors from the world’s key institutes in this area. The book is aimed at microbiologists, immunologists, molecular biologists, cell biologists and other scientific disciplines in the field of biotherapy. It is required reading for physicians dealing with infectious diseases who wish to keep up to date with the developments in this field.